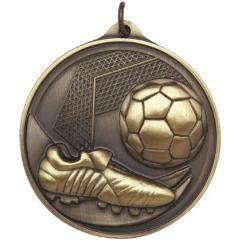 A soccer player dodging with the ball is shown on contrasting frosted and shiny gold metal on this fantastic football medal. This would make a great participation medal to reward to every player in your club, and at 3mm thick but weighing 50g, they are real value for money. Available in shiny gold, silver and bronze with your choice of ribbon colour.